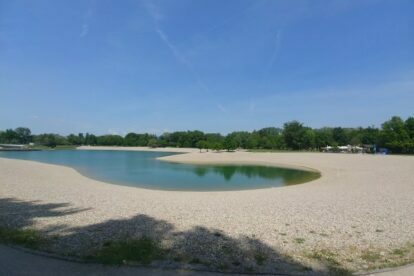 Thanks to the river Sava, there are more than few lakes in Zagreb, but only two of them have a beautifully landscaped environment: Jarun and Bundek. Bundek is the smallest but nevertheless is very pretty and great for walks, jogging, nature watching or sunbathing. What I love about Bundek is its amazing landscaping, most alluring in warm months due to the large number of flowers planted around. The colors and smells are almost seductive in the spring when everything is in bloom. In the summer months, you can swim in the lake during the day and in the evening enjoy an open air concerts under the stars. The stage is floating on the water, making everything even more magical. The track around the lake is 1.6 kilometers long and offers great sights and sounds of nature. Bundek is divided into two lakes connected with a small wooden bridge. One part has pebble beaches and beach bars and the other is left wild and untouched. Here you can see people fishing or just relaxing in the shade of tall trees. The eastern side of Bundek is a big park full of trees with a trail and benches along it. From Bundek, it’s only few steps to Savski nasip and Sava river. It’s easy to access by public transport and if the weather is warm, take a blanket, some snacks, maybe cheese and a bottle of wine and have a memorable picnic. Bundek is a perfect spot for a family or romantic date.